Hello My Name Is (Vol. 3) Linkup Announcement! It's been over five months since Kerry (she's got a great name, right?) and I hosted a "Hello my Name is _____" linkup and we think it's high time we did it again! Hello My Name Is ______ was inspired by the Matthew West song titled… you guessed it … Hello My Name Is! Do you find yourself believing the labels others place on you? Do you place negative labels on yourself? Have you experience life change through the power of Jesus? Through this linkup, we want to encourage you to rid yourself of those false or past labels and claim the truth of who you are in Jesus -- whether it's a drastic change or small changes over time as you've grown in your relationship with Him. 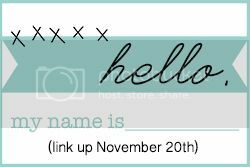 We invite you to come back and join us this Wednesday, Nov. 20th for the 3rd edition of the Hello My Name Is _______ linkup. Don't have a blog? Join us on instagram using the hashtag #beingrenamed.